NIEER’s assessment of state capacity to provide effective preschool education on a large scale relies on “15 essential elements” of high-quality pre-K identified by Jim Minervino based on a research review and case studies. The Essential Elements are based on research into four large, public pre-k programs that each showed positive outcomes. Minervino concluded that all of these elements must be present to a considerable extent for high-quality pre-K to be implemented at scale. 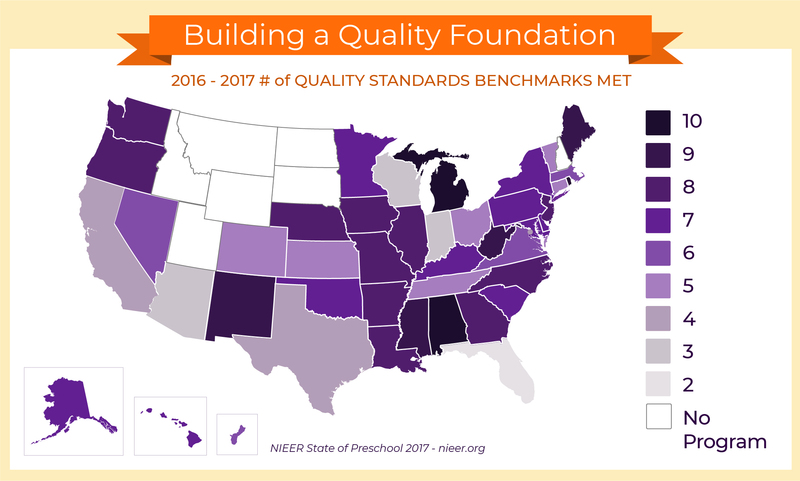 These Essential Elements differ from the NIEER State of Preschool quality standards benchmarks, which gauge whether a set of minimum policies are in place to support meaningful, persistent gains in learning and development. The Essential Elements considers not only policies but also implementation and enabling environment, specifically political leadership and compelling vision, based on research into four publicly funded pre-k programs operating at a large scale that each showed evidence of positive outcomes. For details, click on the titles below. Political leadership and, more rarely, judicial mandates can provide the necessary political will to create, scale up, sustain, and adequately fund high-quality early education. To the extent possible, judgments are based on actions of the Governor and legislature–not just their statements. Increases in funding, quality standards and enrollment, and legislation passed are the strongest indicators. Other strong indicators of political include ballot initiatives and court orders. Also important, but carrying less weight, are actions and statements of business leaders, philanthropic institutions and advocates. Senior early learning leaders, particularly those in the state agency administering the program, articulate a strong vision and exert effective leadership to make that vision a reality. Components include a well-designed early learning system with high expectations and the ability to communicate and successfully advocate for this with internal and external audiences. In addition to qualitatively meeting these criteria, the size of the office of early learning staff and any regional and district level support was taken into consideration. Additional supports for leadership could come from outside the agency, for example, from higher education, or influencers such as business, foundations, and advocacy groups. All lead teachers have at least a BA degree plus suitable credentials in early learning and are paid at same level as K-12 teachers. All classrooms have a maximum of 22 children in each classroom. This is not just required by policy but is also maintained in practice. We report each specific policy and acknowledge that small upward departures might make no discernible difference. However, reducing the number of children in the classroom may improve impacts significantly. All classrooms have a maximum of 11 children per teaching staff person. This is not just required by policy but is also maintained in practice. We report each specific policy and acknowledge that small upward departures might make no discernible difference. However, reducing the number of children per staff substantially below 11 might improve impacts significantly. All classrooms are required to have at least two teaching staff, typically a lead teacher and an assistant. Most children are served or offered a full school day preschool program. The state has comprehensive learning standards that are age and developmentally appropriate and the state strongly supports (e.g., materials, guidance, and professional development) their influence on practice. The state guides and supports the adoption and use of research-based curriculum aligned with the early learning standards, connected to a system of professional development, and implemented with high fidelity. Programs provide strong supports for children with special needs including an emphasis on inclusion. Preschool special education is integrated into the continuous improvement process and other key components of the early learning system. Programs have a well-developed strategy for educating young DLL children that recognizes their unique needs and the importance of home language and culture. The state strongly supports the implementation of this strategy with guidance, materials, and professional development. Ideally, bilingual teachers lead classrooms where there is dominant language other than English. Bilingual paraprofessionals also may be part of strong system of supports. Teachers have high expectations in a system with high expectations and teaching practice is good to excellent. This requires teachers who focus on intentional teaching that strongly supports achievement and socio-emotional development, as well as approaches to learning including curiosity, a lover of learning, persistence and strong sense of self-efficacy. The strongest evidence of high-quality teaching comes from representative samples directly observed using standardized measures (e.g., CLASS, ECERS-R). Strong structural features of programs are not by themselves enough to conclude that teaching is high quality. However, weak structural features are enough to conclude that high-quality teaching is not taking place. Child assessments are aligned with standards and are used to inform teaching with a focus on improving outcomes for children. Assessments inform administrators, teachers, and others who support teacher improvement. The state provides training and other supports provided to ensure teachers and program leaders can use assessments well. Data are collected and regularly used at all levels from the teacher on up to inform decisions regarding practice and improvement. Independent evaluation has been conducted, preferably within the past 10 years. The state supports the use of data for decision-making by others and uses data to drive its decisions. Ideally, there is a state-supported continuous improvement system operating at all levels. Professional development is most effective when sustained as part of a continuous improvement cycle with high expectations for teachers. Professional development is both formal and informal (e.g., peer mentoring). The state and other organizations within the system have adequate capacity to provide sufficient quality and quantity of professional development. Law, regulation, and (or) the state’s activities align standards, curriculum, professional development, and assessment. The state has adequate capacity to support this through the office administering the program and interagency groups.